These Autumn window pictures look so pretty displayed in the classroom or home at Fall, and are a popular craft with children of all ages. Orange, red and yellow cellophane or tissue paper. 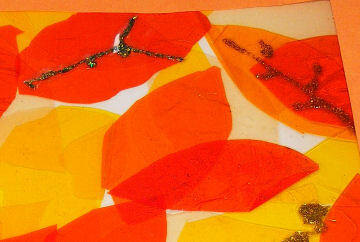 Cut a selection of leaf shapes from the cellophane or tissue paper. If you like you can decorate some with glitter glue and leave to dry. 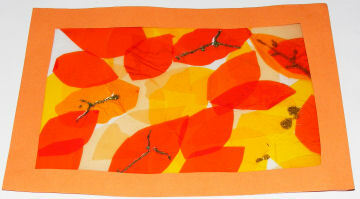 If using a laminator arrange your leaves in the pocket. Ask an adult to carefully feed it through the laminator. If using contact film, cut two A4 size pieces. Carefully peel the back off one and stick on your leaves. Peel the back off the other and carefully stick to the back of your first piece. Cut the middle from your piece of card to make a frame. Use double-sided tape to attach the frame to the leaf picture.